It’s less than a week into spring training, but there’s already a former MVP on the shelf. Toronto Blue Jays third baseman Josh Donaldson has been diagnosed with a right calf strain, an injury he picked up while running sprints during the first full day of workouts. Donaldson was walking with the assistance of crutches on Sunday, when he told the media that he will likely remain on the sidelines for the next two to three weeks while the injury heals. Donaldson says that his left calf was occasionally a problem last season, although it never forced him to the DL. That calf problem didn’t appear to hamper his performance much, as Donaldson hit .284 with 37 home runs last year, posting an OPS of .953, which was actually higher than during his MVP campaign in 2015. If there’s a silver lining to the injury, it’s that it happened so early in camp, leaving Donaldson plenty of time to recover and get enough spring training at bats to be ready for opening day. Of course, the injury is nevertheless disappointing for Donaldson, who says he felt “phenomenal” during workouts prior to Friday’s sprints when he “felt something” amiss with his calf muscle. Clearly, both the Blue Jays and Donaldson are optimistic that the injury will not threaten his availability for opening day. However, one can’t help but feel a little nervous at the now 31-year old Donaldson pulling a muscle. Health has not been an issue for him in the past, as he’s played at least 155 games in each of the past four seasons. However, the Blue Jays have to hope that his calf issue doesn’t signal a change in Donaldson’s good fortune on the injury front. 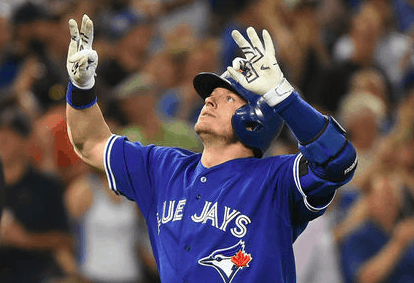 With Edwin Encarnacion leaving the Blue Jays and signing with the Cleveland Indians, Donaldson is undoubtedly the most important figure in Toronto’s lineup. Troy Tulowitzki and Jose Bautista are also important hitters in the heart of Toronto’s order, but both are much bigger injury risks than Donaldson. This makes it imperative for the former MVP to stay healthy and stay on the field once the regular season gets underway. It’s also pertinent to mention that the Blue Jays have little infield depth, especially with starting second baseman Devon Travis taking things slowly at the start of spring after offseason knee surgery. Donaldson missing time during the regular season would be disastrous for Toronto, as there’d be a massive drop off from him to whomever fills in for him. For now, there’s nothing to fear, but Donaldson’s injury early in spring is a gentle reminder of just how important he is to the team’s hopes in 2017.